awesome job in doing it! Thanks. To be honest it's easier than HD graphics but it depends of your art style. I made one of the map for the final dungeon with four special enemies ran via a script. Basically, once all four enemies are killed, they respawn from four doors. I'll probably re-use this idea earlier in the game with much easier (and fewer enemies), like in Metroid. Eventually I'll also try to add enemies that shoot projectiles but the projectiles will probably despawn after traveling about 10 squares away, otherwise they'll just loop forever across the maps. Oh and since your main character is an enemy robot whose firmware got corrupted (resulting into him becoming friendly), you will actually have to fight similar robots later in the game (probably much harder). 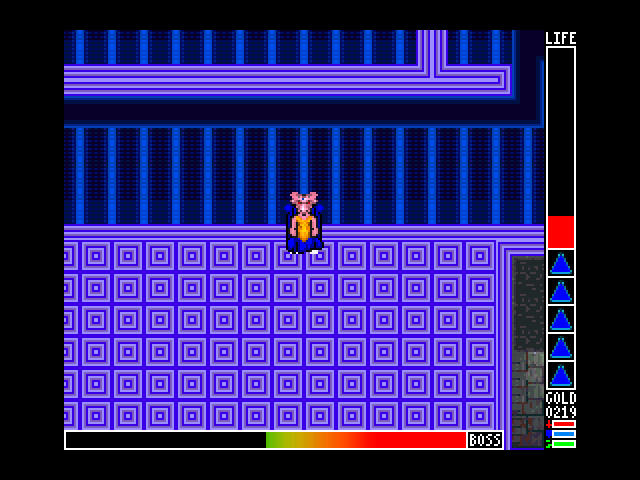 I should also add tiles that can cause damage, such as spikes, and switches that can turn them or other things off. Lol thanks. Note, however, that this uses RPG Maker 2003, so credits for the engine goes to Enterbrain and ASCII, as well as whoever officially released it outside Japan via Steam recently. But I'm kinda happy about the game because RM2k3 was not designed for action/real-time RPG combat, yet I somehow managed to have some particularly fast-paced battles/gameplay (it starts slower, though, since you need to buy speed upgrades for your attack). Also the funny thing with this project is that many of its bugs ended up becoming features, such as the double/triple hit bug when you attack an enemy trapped in a dead-end or sometimes when running straight towards him while attacking. Yeah, that's a pretty interesting mechanic. Also, while this is the final area of Quebec City, some of the obstacle puzzles in there will also appear earlier in the game, particularly in the Forgotten Ruins. By the way, the test boss was made much harder after I implemented those electric obstacles. I had forgotten how in 2008 I setup enemy attack speed and now remembered there were two parameters to prevent you from taking 100 hits at once or something. The Tibestian robot clones similar to your character also attacks much faster than most other regular enemies in the game. A mini-boss was also added, which often moves in circle and is protected by two electric things on each side. He is invincible while they appear and he causes a lot of damage (although he doesn't take too long to defeat). EDIT: There might be issues with saved games. If you save your game in Montcalm Tower then reload, then it might crash. Major update, I would say: Bosses and mini-bosses now have energy bars! Basically, when a boss fight starts, HP divider and multiplier stats are applied to a second HP variable that cannot be higher than a certain amount, just so that the HP bar remains the same size regardless of the boss HP. I think the North Side and West Side of Quebec City are pretty much complete, at this point. East Side saw some progress but is not fully complete yet. I also added a new boss. Also, like in Star Ocean 5, there's a shop in the final dungeon. Otherwise, it was just next to impossible to backtrack all the way back to the West Side shop in order to buy new potions and upgrades.